I'm always on the lookout for foundations and BB creams with a good level of sun protection. I wear dedicated sunscreen under my makeup, but being pale and prone to sunburns makes you welcome any extra coverage you can get. 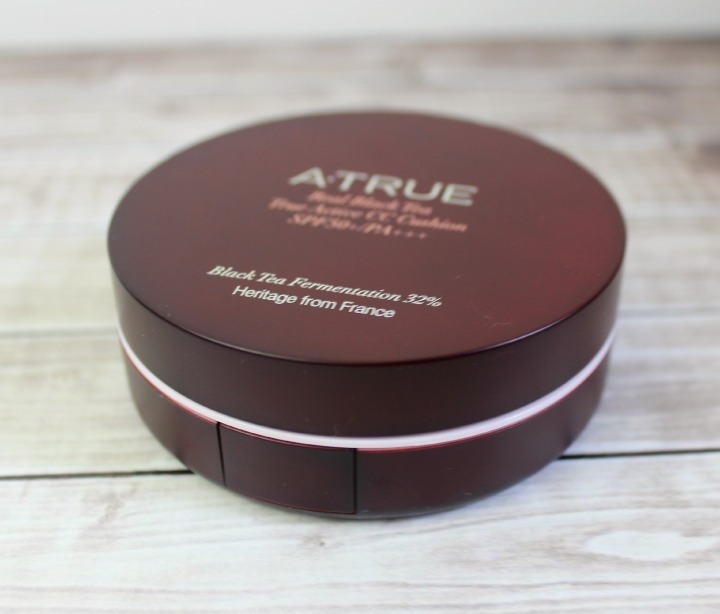 Today I'll reviewing a CC cream that boasts excellent sun protection and nearly BB-like coverage: The ATRUE Real Black Tea True Active CC Cushion (SPF50+/PA+++). 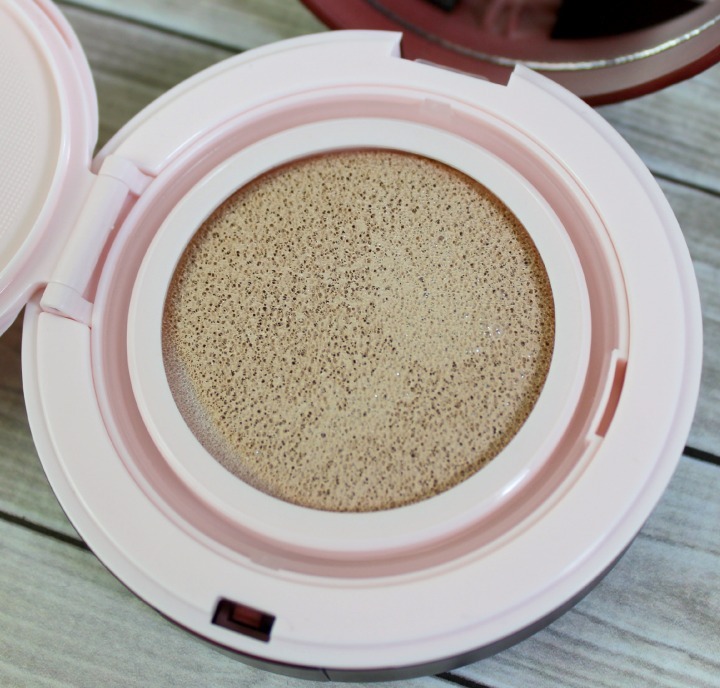 "This CC Cushion utilizes a formula that benefits from a foundation which holds multiple functions that help rejuvenate and illuminate the skin tone. Such features help maintain the skin's overall brightness and transparency. This revolutionary formula benefits from a foundation which holds six multi-functions that help revitalize and illuminate the skin tone maintaining overall skin brightness and transparency. Micro particles of mineral powder completely fill the uneven skin tone. Its color controlling effects help find the individual natural beauty to show a clear and gorgeous look. A·TRUE tries to minimize harsh chemical ingredients. Formulated without Paraben, Ethanol, Phenoxyethanol, Benzophenone, Triethanolamine, Talc, Mineral Oil, Petrolatum and SLS." The Real Black Tea CC Cushion is available in two shades: No. 1 Light Beige and No. 2 True Beige. I tested the cushion in No. 1/Light Beige. This cushion contains both physical and chemical sunscreens. It also contains niacinamide pretty high up in the ingredients list, so the brightening claims seem somewhat plausible. CosDNA flags Zinc Oxide, Butylene Glycol, and Stearic Acid as possible minor acne triggers, but overall the ingredients list looks pretty good. According to a rather lengthy blurb in the product listing, ATRUE only selects high quality tea for their ingredients: "By selecting the finest tea leaves only, F.T.G.F.O.P (Finest Tippy Golden Flowery Orange Pekoe) is harvested within Castleton Tea Garden, placed in Darjeeling, India, at altitudes of 1,500m. This unique environment is home to the F.T.G.F.O.P variety of teas. Such rare selections were once so valued they would be compared to gold. Today, they are harvested for the enjoyment of our customers. We present the precious value of the top grade black tea which holds the first golden buds of spring." Thanks to ATRUE, I now know what FTGFOP is. Finest Tippy Golden Flowery Orange Pekoe. Say that three times fast. 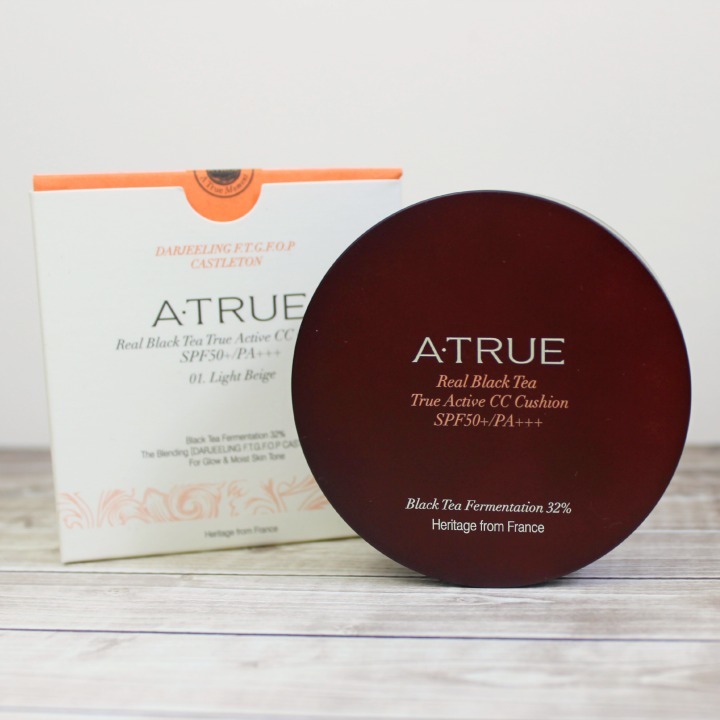 The ATRUE Real Black Tea True Active CC Cushion SPF50+ PA+++ is regularly priced at US $38.00 for 12g of product in a cushion compact, however at the time of publishing this post, ibuybeauti has it on 1+1 special (buy the 12g cushion, get a 12g refill free). The cushion case is well-constructed. It's not the most heavy or substantial one I've tried (that award still goes to Laneige), but it closes securely and has an adequately-sized mirror. One unique thing about the case: The inner plastic "shelf" that the applicator sponge closes very, very tightly. I view this as a positive attribute as it keeps the cushion from drying out, but be prepared to exert a little more energy than usual to get it open. Speaking of the applicator sponge, it's soft and nice. I think it might be a little bit softer and more absorbent than the blue sponges you sometimes see in BB cushions, but it still works well to pat on product and blend for a natural finish. Heyyy I look tired! Funny how that works first thing in the morning. Anyway, I like the color-correcting and light coverage this cushion gives. I would describe the finish as semi-matte. It is ever-so-slightly dewy, but not full-on shiny like a lot of CC creams. 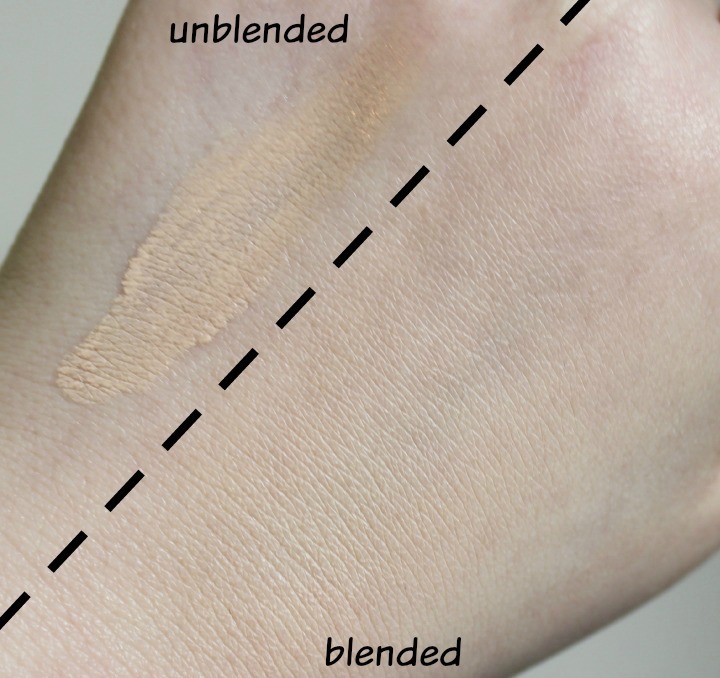 The texture is a bit on the drier side and therefore probably best suited to oily or combo/oily skin... maybe with a dusting of setting powder if you're very oily. It looked really natural on my nose, but accentuated a couple of little dry patches I have on my forehead. If you have drier skin and really want to try this cushion, I recommend making sure your face is extremely well exfoliated and moisturized first. Crappy indoor lighting, but you can still see that my skin has consistent tone and the same semi-matte finish. I didn't touch up at all during the day. Madness! Other considerations... this product is fragranced. It smells kind of like generic floral-y sunscreen to me, but I didn't find the odor overwhelming or offensive. 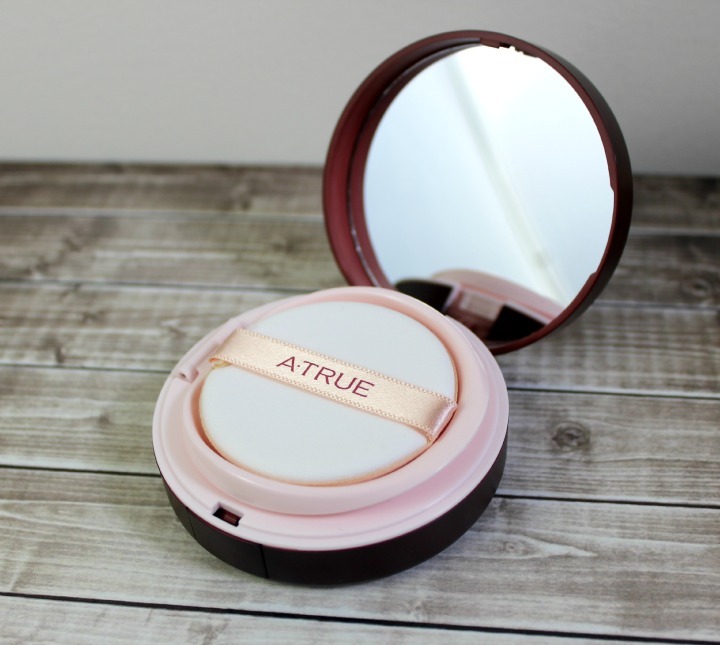 I was pleasantly surprised by the ATRUE Real Black Tea True Active CC Cushion. It's not like I expected it to be bad or anything, but I was truly impressed with the above-average level of coverage it provided and how well it lasted throughout the day. I haven't been using it long to observe any long-term skin benefits, but haven't experienced any breakouts or irritation from wearing it for lengthy periods of time. I do think the formula is a bit dry for my skin type (which is normal to dry overall except for a couple oily spots in the T-zone), but if you have oilier skin than I do, I'd say it's well worth checking out. The only negative aspect I can think of is the limited range of shades. I don't have No. 2/True Beige, but from the stock photos it doesn't look like it's a whole lot darker than No. 1/Light Beige, so it's really only suited to the paler folk out there. If you're looking for alternatives, I recommend looking at the comments on ibuybeauti's ATrue Real Black Tea CC Cushion product page—they've answered quite a few questions from customers looking for shade recommendations. What do you think of the ATRUE Real Black Tea CC Cushion? Do you prefer your CC and BB creams to be more matte or more dewy? I would say this gives you a my skin but better look. Lighter coverage but definitely evens out the complexion. I prefer matte products in general since my skin is normal/oily but leans more on the oily side. This sounds lovely. I really want to try one of these bb cushion things. This looks very nice and still natural on your skin. My favorite cushion even though I have dry skin. But I always prime beforehand, so it's never been a problem. The only thing that bothers me about this cushion is that it goes "bad" in the case fairly quickly. If you don't use it regularly and don't use it up, chances are it will turn all funky in the case. I suppose that's the ferment and lack of preservatives, but still, I didn't expect it to go all yucky so quickly. I wouldn't be surprised if this cushion got very popular, because it is good! I like a dewy finish. It's so easy to go overboard and look greasy though, lol. My skin but better is an excellent way of putting it! Cushions in general are very cool! You can toss them in your purse easily. Nowadays you can also get empty BB cushion cases so you can mix your own foundation/moisturizer/whatever in. I like a somewhat dewy finish, but sometimes you really don't want to be full-on shiny, lol. I haven't experienced the cushion going funky (yet), so I can't really offer further comment on that at this point. The CC cream formula does contain at least one type of preservative, but maybe that's not "enough" to help it keep for months and months and months once opened. Not sure. Honestly though, I keep a close eye on all of my cushion products because the sponge can be a breeding ground for bacteria, even if the BB/CC cream itself is loaded with preservatives. This is true of all products with a cushion or sponge, so... yeah. If you want something that will last for several months to a year, it's probably best to get a product packaged in a traditional tube or bottle! Have you looked into DIY cushions at all? You can buy a cushion case by itself and then mix in whatever BB or CC cream you want. That way you can use a BB/CC you know doesn't break you out but still get the cushion experience! I think the version Missha makes is probably the most popular/well-known one. I think it took about 2 months for it to go slightly rancid. it started to smell like old butter, you know what I mean? I tossed the inside and wanted to buy just a refill, but I'm mad at A-True right now, because of the prices of the refill alone. But I'm going to hold off a while anyway. I have way too many cushions. Washing the puffs is a good idea! Honestly, not all BB cushions go bad - I just tossed a Laneige cushion that I opened a year ago and there wasn't any mold or nastiness on it. But I barely used that cushion, so who knows how it would be if I was dipping my puff into it all the time. I have had lip products and concealers with cushiony tips get nasty though, blah. Best just to keep an eye on them! ibuybeauti sent me this cushion for review via EMS so I'm not sure how long it would take under normal circumstances, but I ordered something else from them before with standard shipping and it took about 3 weeks as I recall? Most of my orders from Korean stores seem to take around 2-4 weeks, so that feels normal.